1994 - Arezzo (Italy), Biblioteca Civica Città di Arezzo, exhibition: Que bien resistes! Dimensions: m 18 x 7,5 x h 1. 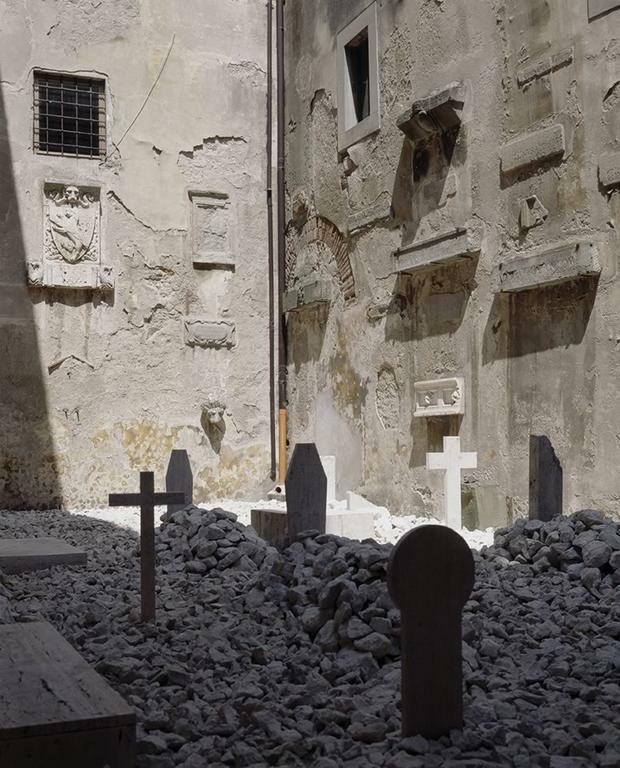 For this occasion, the courtyard of the Palazzo Pretorio in Arezzo, home to the Municipal Library, has been transformed into ambient sculpture. In recognition of the fiftieth anniversary celebration of the liberation of this Tuscan City from Nazi-fascism, the sculpture is motivated by a profound civic sense. 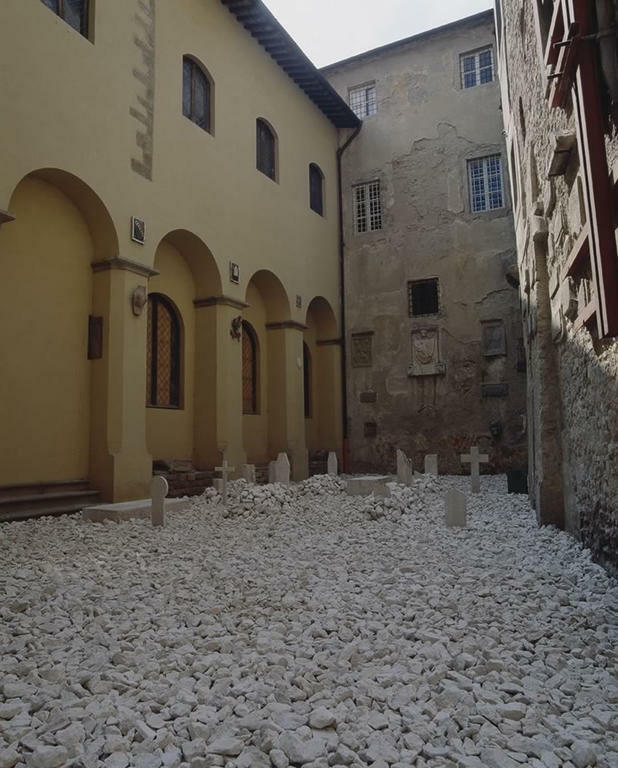 The moral necessity of stopping the present wars in the former Yugoslavia and in Rwanda, with their tolls of death and violence, transmute the inner courtyard into a cemetery. Two parallelepiped slabs extended on the ground like tombs emerge from an expanse of travertine fragments. Ten steles and funerary stones decorated with Christian, Hebrew and Islamic symbols are erected around these, thus re-uniting diverse religions. The remains of the ancient inscriptions attached to the courtyard walls appear to receive the stone strewn on the soil, re-echoing it. Faced with enormous, contemporary tragedies, Dompè’s message is that human dignity is a primary inner imperative that drives towards resistance. To resist is precisely to find the force with dignity to oppose the insanity of war.